Since the passing of former Senator John McCain last week, there has been debate among U.S. Senators as to whether or not they should rename the Russell Senate Office Building in honor of the deceased lawmaker. The building, which can be found at 2 Constitution Ave NE in Washington, DC, is currently named after former Democratic Sen. Richard Brevard Russell. 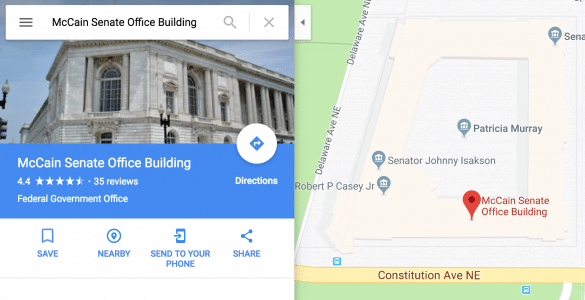 While the debate among Senators continues, with many Republicans and Democrats alike favoring renaming the building, apparently Google has wasted little time, already renaming it “McCain Senate Office Building” on their web and navigation platform, Google Maps. It is uncertain how this change was made, or who is responsible. Google does allow users to edit names of certain locations, but they review all changes before they become official. Perhaps someone renamed the building and Google accidentally approved the change, or maybe someone who works for Google is behind the prank. The Russell Senate Office Building was built in 1903-1908 and is the oldest of all the Senate office buildings in Washington. It covers 698,921 square feet.